An interesting system indeed. In Figure 3 inside the paper the authors plotted the symmetric and asymmetric C-H stretching frequencies against the H:::H distances and obtained a quasi-linear relation (the correlation coefficient of the linear fitting was not reported). It would be interesting to calculate anharmonic C-H frequencies and plot them against the corresponding H:::H distances to check the role of anharmonicity of the molecular vibrations. If the energy barrier of the above “piezochemical” reaction is not too high, then such “molecular compression chambers” (a term introduced by Baldridge and Siegel, see: J. Phys. Org. Chem. 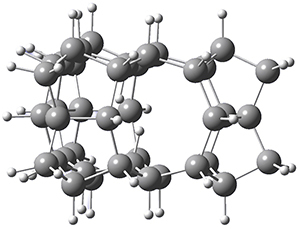 2015, 28, 223) could be useful for the in-situ production of molecular H2. We have not done any regression and this is why no correlation coefficient has been reported in the paper. We also tried to reach to shorter distances but negative force constants were appeared. The idea of piezochemical reaction is indeed interesting and worth trying. By the way I am not sure whether it is possible to be realized experimentally. Here are some QTAIM values on 1, optimised at the B3LYP+D3/Def2-TZVPP level (doi: 10.14469/ch/191885) for the close H…H contact. There is little evidence for incipient formation of H2. I have not investigated open shell solutions for this molecule (is the wavefunction stable to open shell solutions?). Yes, I agree that there is little evidence for incipient formation of H2. However, we need to consider that the QTAIM results are concerned with the equilibrium geometry of 1 (at 0 K) whereas @RT the cage vibrations would bring the two H atoms at a closer distance. Also, some clever modification of the cage (e.g. chemical functionalization) might help to initiate the reaction. At the B3LYP+D3/Def2-TZVPP level, the wavefunction is indeed stable to open shells by some margin (3.000-A’ Eigenvalue= 0.2029093, 1.000-A’ Eigenvalue= 0.2059491, doi: 10042/196145). I would imagine that the two C-H vibrations must indeed be highly anharmonic as you suggest, but @RT seems unlikely to access the biradical states given their energies above? nice that you computed the stability of the WFN to open shell solutions (unfortunately I cannot access the link doi:…). I wonder whether the energy of the biradical states could be lowered by modifying the system. Another possibility would be using a magnetic field to shift the S-T population.